Ancient & Modern Pueblos – Oldest Cities in the U.S. Situated throughout the southwest are dozens of historic pueblos, some of which date back for centuries. These Pre-Columbian towns and villages, which are primarily located in the American Southwest, were often situated in defensive positions on high mesas, cliffs, and in canyons. The Pueblo Indians, who built these communities, are thought to be the descendants of three major cultures including the Mogollon, Hohokam, and Ancient Puebloans, with their history tracing back for some 7,000 years. 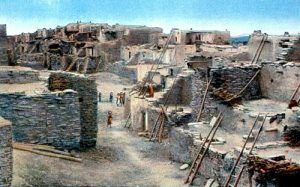 These apartment-like structures, sometimes several stories high often surrounded an open plaza and were occupied by hundreds of thousands of Pueblo People. The structures were usually made of cut sandstone or sun-dried bricks faced with adobe — a combination of earth mixed with straw and water. The outer walls were very thick, sometimes several feet, which provided not only insulation but, also defense. Normally, outer walls had no doors or windows, but rather, openings on the roofs with ladders leading into the interior. In case of an attack, outside ladders could easily be pulled up. The buildings had flat roofs, which served as working or resting places, as well as observation points. Each family generally lived in just 1-2 rooms. 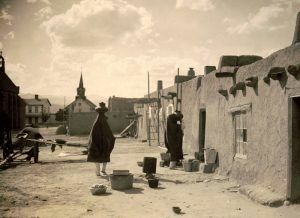 Each pueblo was an independent and separate community, though many shared similarities in language, customs, and leaders. 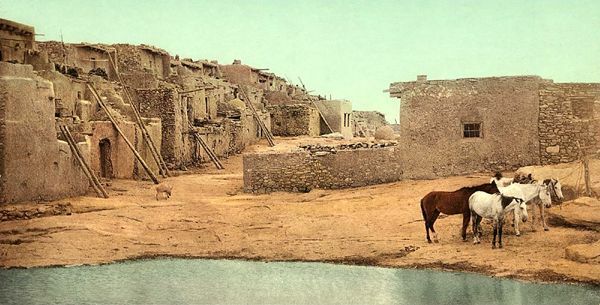 Today, many of these centuries-old adobe pueblos are still maintained and occupied and Pueblo Indian tribes number about 35,000 people who live primarily in New Mexico and Arizona along the Rio Grande and Colorado Rivers. Most of the pueblos are open to the public and many of their ceremonies can be attended. Each pueblo has its own rules and etiquette for visitors, which should be reviewed before visiting. In addition to contemporary pueblos, there are numerous ruins of ancient communities throughout the Southwest. i have stumbled upon an older civilization of native healers who while not known by name were perhaps the origin of southwestern native american medicine. i have no other resource except a tale told to me while in college in pueblo, colorado. if anyone knows about this lost race please contact me at daletalbot70@gmail.com. thank you.